For the theorem sometimes called Thales' theorem and pertaining to similar triangles, see Intercept theorem. Thales's theorem: if AC is a diameter, then the angle at B is a right angle. In geometry, Thales' theorem states that if A, B, and C are distinct points on a circle where the line AC is a diameter, then the angle ∠ABC is a right angle. Thales' theorem is a special case of the inscribed angle theorem, and is mentioned and proved as part of the 31st proposition, in the third book of Euclid's Elements. It is generally attributed to Thales of Miletus, who is said to have offered an ox (probably to the god Apollo) as a sacrifice of thanksgiving for the discovery, but sometimes it is attributed to Pythagoras. Indian and Babylonian mathematicians knew this for special cases before Thales proved it. It is believed that Thales learned that an angle inscribed in a semicircle is a right angle during his travels to Babylon. The theorem is named after Thales because he was said by ancient sources to have been the first to prove the theorem, using his own results that the base angles of an isosceles triangle are equal, and that the sum of angles in a triangle is equal to 180°. Dante's Paradiso (canto 13, lines 101–102) refers to Thales's theorem in the course of a speech. The following facts are used: the sum of the angles in a triangle is equal to 180° and the base angles of an isosceles triangle are equal. Provided AC is a diameter, angle at B is constant right (90°). Since OA = OB = OC, ∆OBA and ∆OBC are isosceles triangles, and by the equality of the base angles of an isosceles triangle, ∠OBC = ∠OCB and ∠OBA = ∠OAB. are both diameters of the circle and therefore are equal length, the parallelogram must be a rectangle. All angles in a rectangle are right angles. For any triangle whatsoever, there is exactly one circle containing all three vertices of the triangle. (Sketch of proof. The locus of points equidistant from two given points is a straight line that is called the perpendicular bisector of the line segment connecting the points. The perpendicular bisectors of any two sides of a triangle intersect in exactly one point. This point must be equidistant from the vertices of the triangle.) This circle is called the circumcircle of the triangle. One way of formulating Thales's theorem is: if the center of a triangle's circumcircle lies on the triangle then the triangle is right, and the center of its circumcircle lies on its hypotenuse. This converse is also true. the diagonals of a rectangle are equal and cross each other in their median point. The quadrilateral ABCD forms a parallelogram by construction (as opposite sides are parallel). Since in a parallelogram adjacent angles are supplementary (add to 180°) and ∠ABC is a right angle (90°) then angles ∠BAD, ∠BCD, and ∠ADC are also right (90°); consequently ABCD is a rectangle. Let O be the point of intersection of the diagonals AC and BD. Then the point O, by the second fact above, is equidistant from A,B, and C. And so O is center of the circumscribing circle, and the hypotenuse of the triangle (AC) is a diameter of the circle. the square of the length of a vector is given by the dot product of the vector with itself. (A − B) · (B − C) = 0, because ∠ABC is a right angle. This means that A and B are equidistant from the origin, i.e. from the center of M. Since A lies on M, so does B, and the circle M is therefore the triangle's circumcircle. The above calculations in fact establish that both directions of Thales's theorem are valid in any inner product space. Given three points A, B and C on a circle with center O, the angle ∠AOC is twice as large as the angle ∠ABC. See inscribed angle, the proof of this theorem is quite similar to the proof of Thales's theorem given above. If B is outside the circle, then ∠ABC < 90°. Constructing a tangent using Thales's theorem. Thales's theorem can be used to construct the tangent to a given circle that passes through a given point (see figure). We can refer to the image beside, this is one of the cases where Thales's theorem is used very frequently. Thales's theorem can also be used to find the centre of a circle using an object with a right angle, such as a set square or rectangular sheet of paper larger than the circle. 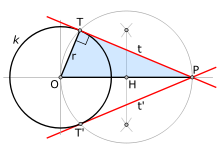 The angle is placed anywhere on its circumference (figure 1). The intersections of the two sides with the circumference define a diameter (figure 2). Repeating this with a different set of intersections yields another diameter (figure 3). The centre is at the intersection of the diameters. ^ Heath, Thomas L. (1956). The thirteen books of Euclid's elements. New York, NY [u.a. ]: Dover Publ. p. 61. ISBN 0486600890. ^ Allen, G. Donald (2000). "Thales of Miletus" (PDF). Retrieved 2012-02-12. ^ Patronis, T.; Patsopoulos, D. The Theorem of Thales: A Study of the naming of theorems in school Geometry textbooks. Patras University. Retrieved 2012-02-12. Heath, T.L. (1921). A History of Greek Mathematics: From Thales to Euclid. I. Oxford. pp. 131ff. Weisstein, Eric W. "Thales' Theorem". MathWorld. Demos of Thales's theorem by Michael Schreiber, The Wolfram Demonstrations Project.